The foot hills of the Eastern Himalaya lead us to the culturally rich district of Cooch Behar in the state of West Bengal, India. 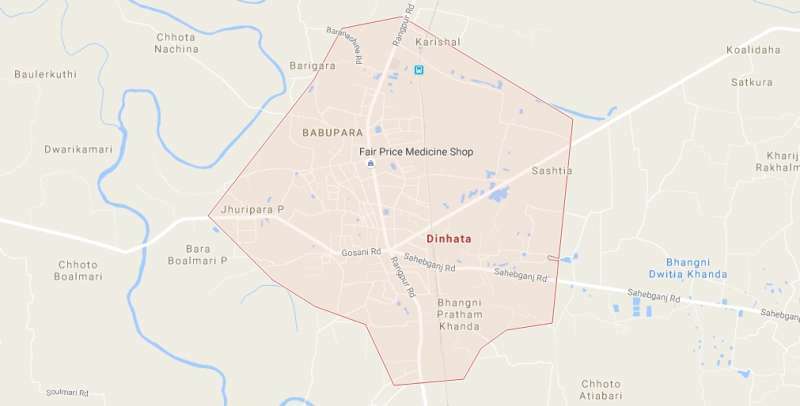 “Dinhata” is the headquarters of the Dinhata subdivision, and a municipality in this Cooch Behar District. Dinhata is one of the largest subdivisions of Cooch Behar having the border of the state of Assam on the east and an international border of Bangladesh to the south and west, thus serving as an important transit point for the travellers to the neighbouring countries, states and regions renowned worldwide for adventure, leisure, religious and wildlife experiences. Dinhata provides a corridor for travellers to the SAARC countries of Bangladesh, Bhutan and even Nepal. Further, in India, Dinhata serves as a gateway to the famous travel destinations like Sikkim, Darjeeling, Dooars and the North Eastern States of Assam, Meghalaya, Arunachal Pradesh and further. According to the history, this area was once ruled by the Palas and Senas. Coins and sculptures of the Mughal era also provide ample proof and testimony of their presence here. The region shows its historical importance by the existence of the temples and the mosques found in this region. This region was later ruled by the Royals of the Koch Dynasty from Cooch Behar for around 4 centuries. Earlier Bhutan too was a part of this place till it became independent two years after the Indian independence in 1949. Dinhata has a notable political history as well. The former President of Bangladesh, Hossain Mohammad Ershad, had studied in Dinhata High School. His son was born in Dinhata and some of his relatives still live here. In recent political events, in 2015 Dinhata witnessed the implementation of a landmark Indo-Bangla Land Border Agreement between India and Bangladesh which ratified the exchange of India–Bangladesh enclaves, also known as the “chitmahals” between the two countries for simplifying the international border. India received 51 Bangladeshi enclaves (covering 7,110 acres (2,880 ha)) in the Indian mainland spread across Dinhata, Mekliganj, Sitai, Sitalkuchi and Tufanganj assembly constituencies. While Bangladesh received 111 Indian enclaves (covering 17,160 acres (6,940 ha)) in the Bangladeshi mainland. The enclave resettlement camp set up in Dinhata is one of the three camps in the state of West Bengal that provides temporary residence for two years, or until permanent settlements are built for the newly migrated enclave population. The network of railways have an extensive reach in and around Dinhata with multiple trains local plying between major railway stations and Dinhata to connect the subdivision with the rest of the country. These belong to Northeast Frontier Railway under Alipurduar Railway Division. The approximate distances to a few important railway station are provided below. Dinhata is also well connected by roads with important local, state and national highways where various public and private surface transport options are widely available. The state owned North Bengal State Transport Corporation (NBSTC) runs regular buses from major towns and cities to and from Dinhata. Further, private car rental options are also available for personalised travel itineraries. The major travel attractions being multiple road connectivity options to for traveling to Bhutan through Phuntsholing and to Bangladesh via Changrabandha. A highly humid atmosphere and abundant rains characterise the climate of this region, with the temperature averages around 24.5 °C. The Period from June to beginning-of-October is south-west monsoon season. October to mid-November constitutes post monsoon season. Cold season being November to February and hot season being March to May. January is the coldest month with temperature varying between 5°C to 28°C. The atmosphere is highly humid throughout the year except February to May when relative humidity is as less. Owing to the rich cultural and religious history the Cooch Behar district has many monuments, temples and mosques that dates back to the early 11th and 12th century. As the majority of the population in this area are Hindus, this district is considered a pious land with lots of Temples and ancient mythological structures as well as monuments that could not be restored through ages and now facing gradual destruction to ruins. Goshanimari’s history is very important for medieval period of East and North-eastern part of India. 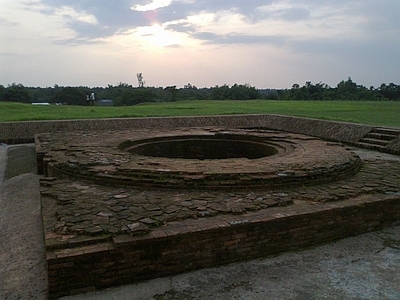 Goshanimari is situated at a distance of about 13 km from Dinhata. Here once can find the magnificent ancient remains of the Kings of Kamtapur and witness their power and wealth. 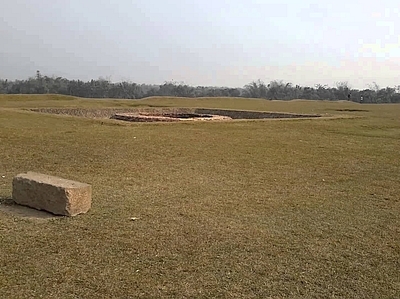 The Rajpat of Goshanimari is an excavation site of the archeologically important erstwhile state of “Kamtapur” and its ancient capital of the same name. The word Rajpat has been derived probably from the Bengali ‘Rajbari’ or ‘Rajbati’ or ‘Rajprasad’ meaning the residence of the Royals. The mound of Rajpat is at present protected by the Archaeological Survey of India and is believed to have many underlying ancient structures and monuments. The citadel is triangular extending from west to east with a perimeter of about 32 km with four huge gates and protected with rampart and diches. 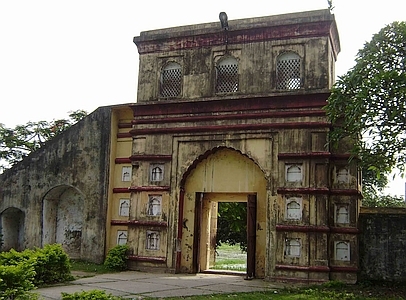 The Kamtapur state later came to be known as the state of Cooch Behar. The “Kamteswari Temple” is situated at Goshanimari on the left bank of Singimari. The original temple however is now destroyed and the present temple was established by Maharaja Pran Narayan of Kamtapur in the year 1665. Inside the temple the throne of Debi (Goddess) is situated. Beside the main temple two smaller temples also exist at the rare of the temple courtyard. At the gate a ‘Tarakeswar Sivalinga’ exists. A large number of festivals are observed here of which the Batha Festival of Debi in the month of Magh is worth mentioning. Pilgrims and visitor from around the region flock to this ancient temple for performing various rituals and attend the festivities.